One way of understanding inequality between countries is by adopting a measure of the ratio between the best-off tenth to the worst-off tenth of the population. The higher the ratio, the more inequality there is in the country. In more equal countries there is a more balanced distribution of wealth. It is not a comparison between rich countries versus poor countries. Studies have shown that the most unequal affluent countries contribute more to a range of environmental problems than their more equal counterparts. This is because people in higher unequal countries: produce and consume more, eat more meat per person by weight, waste more energy and heat and water for personal use. They also contribute more to climate change through their higher emission of carbon dioxide (CO2). In more unequal countries, for instance, there are more products that are designed for a short life cycle, which produces greater profits and more waste. The poor in unequal countries tend to eat cheap fast food, largely meat, in part because it is widely available. The more affluent in these unequal countries have access to even better meat and lots of it, so that obesity becomes a major health problem. People in unequal countries, on average, consume more water for personal use, or are more wasteful. For instance, water consumption per person in the US is 3.5 times higher than in Germany. In most unequal countries, the “car is king” for transport. Obesity is a problem not only because of lots of meat but also because the people spend lots of time in their cars. In the US, for instance, less than 5% cycle or walk to work compared to 50% in the Netherlands. And the people in unequal countries, like the US and Canada, also consume more than double the amount of gasoline as in other affluent countries. In general, the more unequal the rich country is, the more CO2 is emitted. For example, people in the US emit more CO2 than any other of 25 rich countries, with emissions per person twice those of the Japanese and three times those of the French. While the rich in unequal countries waste heat and power because cost is not determinative of use, the poor in such countries use power inefficiently because they cannot afford to retrofit their homes. 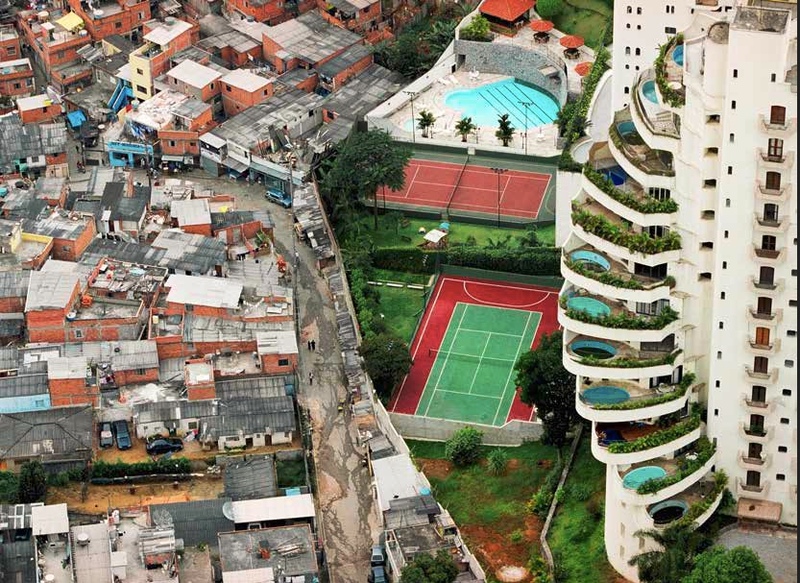 The relation between inequality and the environment is a two-way street. Just as inequality has direct impacts on the environment, the environment, and particularly climate change, can deepen or aggravate inequality. Generally, a 1% Celsius (C) temperature rise will cost the US economy 1.2 % in lost gross national product (GNP), on average. But that loss will be felt much more sharply in different parts of the US. The poorest 100 of the counties in the US will lose on average about 11% of their gross domestic product (GDP) if temperatures increase by 5°C by 2100, based on analysis of impacts on agriculture, crime, coastal storms, energy use, climate-related deaths, and disrupted working conditions. At the same time, the richest counties in the US are projected to lose only about 1% of their county GDP. States in the south and lower mid-west are the poorest parts of the US and they will become the warmest parts of the country, leading to increasingly worse heat waves. Further warming will aggravate the already existing disparity between poor and rich in these states. While states like Texas, Louisiana and Georgia will feel the adverse impacts from climate change, Florida remains the poster child. Union County Florida is the poorest county in the state and it is projected to lose 27% of income by 2100, and summer highs will rise from 90° to 95°. That increase in high temperature is considered a tipping point that will lead to more heat-related deaths, and a drop in labor productivity, as well as more violent crime. At the same time, states in New England and the pacific north-west, already more economically advantaged than southern states, will experience somewhat warmer conditions that will lead to fewer deaths from cold winters and allow more crops to grow. One factor in this growing disparity is that in unequal countries the attitude often prevails that people are entitled to do what they want irrespective of the consequences on others, usually less fortunate. Such an attitude can develop where pay differentials and the highest incomes are quite high and there is often little empathy from those who have toward those who do not. In effect, the rich assume the power to pollute the environment of poorer people. We should not be surprised at these impacts as we have seen how inequality is also insidious when it comes to armed conflict. Security agencies in the US and Europe, and elsewhere, have long understood that: “Poverty reduces the opportunity cost of violence. Scarcity intensifies competition over resources. Inequality pits have-nots against haves. And poor states are weaker — less able to contain conflict once it breaks out.” See Porter, New York Times. These lessons seem totally lost on T-Rex (a/k/a Trump) as he is gutting international development aid to poorer countries in favor of arms “deals” at the same time he has announced that the US is withdrawing from the Paris climate change accord. Both actions will make this earth a more vulnerable place. David Roberts, “The best way to reduce your personal carbon emissions: don’t be rich,” Vox (14 July 2017).